Web api is the buzz in the market these days for providing rest based api's. After its first release, further versions have been released, with version 2 being the one with some of the major changes. 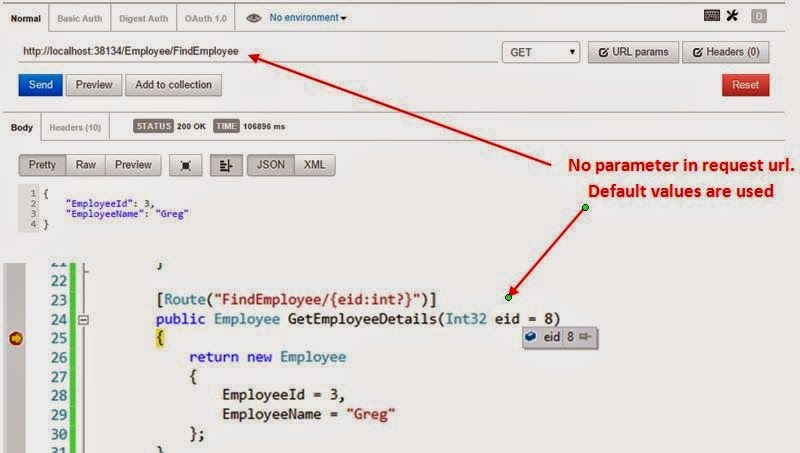 One of the very good feature introduced was the use of Attribute based routing of the web api requests. There were other feature also, but this feature is very big and useful in itself and our discussion will be for this only, in this article. Also, this article has its reference from a great write-up on this feature by Mike Wasson, here, which explains these features. If you have worked with initial version webapi, you must be aware of concept of routing templates for the api controllers. But in its version 2, instead of defining routing templates in WebApiConfig.cs, we can define these templates at the method level i.e. 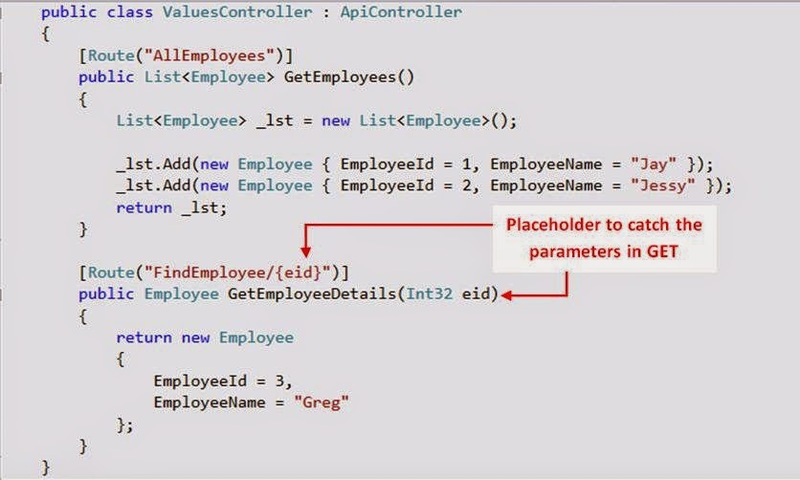 on the methods of the web api controllers. 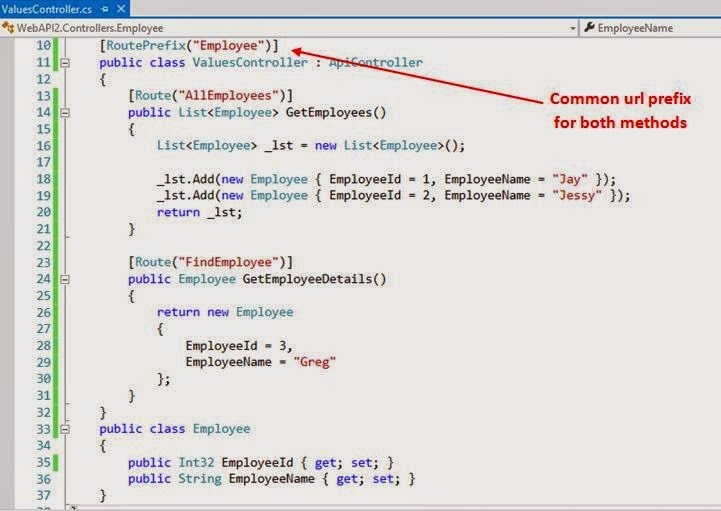 This is possible through the use of the Route and RoutePrefix attributes, added to the webapi2. 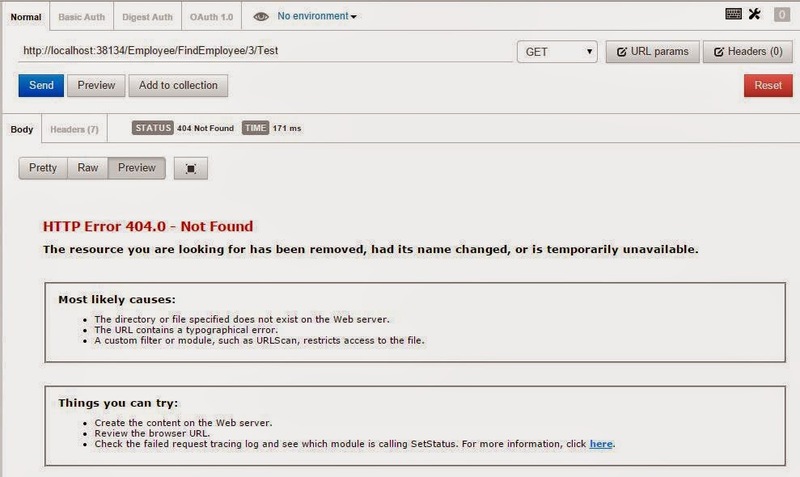 This does not means that we cannot use the routing template with convention of first release of webapi along with this. Both can be used side by side. So let's discuss these. 1. 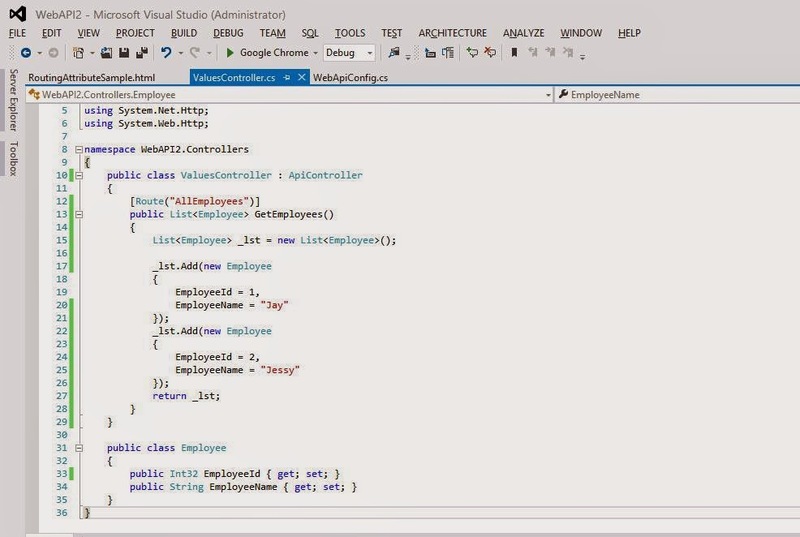 Create a new MVC web application, with web api template. 2. 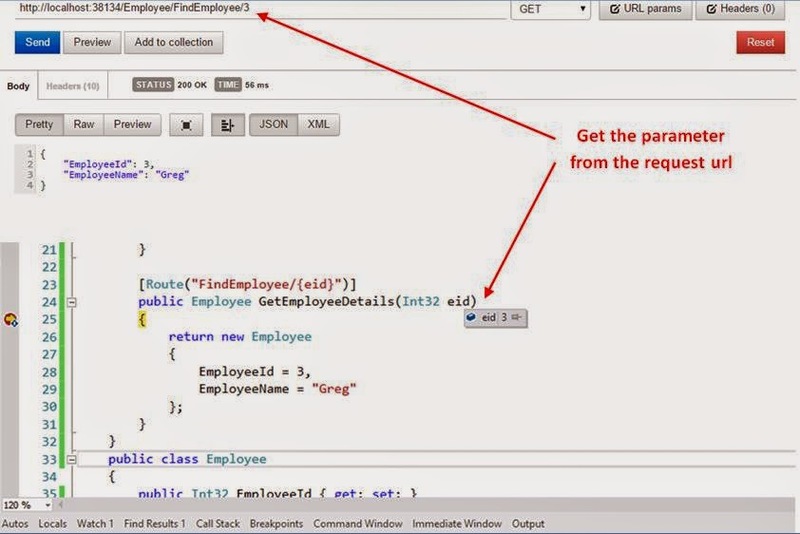 Add reference to the webapi2 libraries, using the nuget package. Next, open the WebApiConfig.cs file, remove the default routing templates and simply add config.MapHttpAttributeRoutes() to enable the attribute based routing. This is the result which was expected. Now let's send the request with the changed url's and see the results. 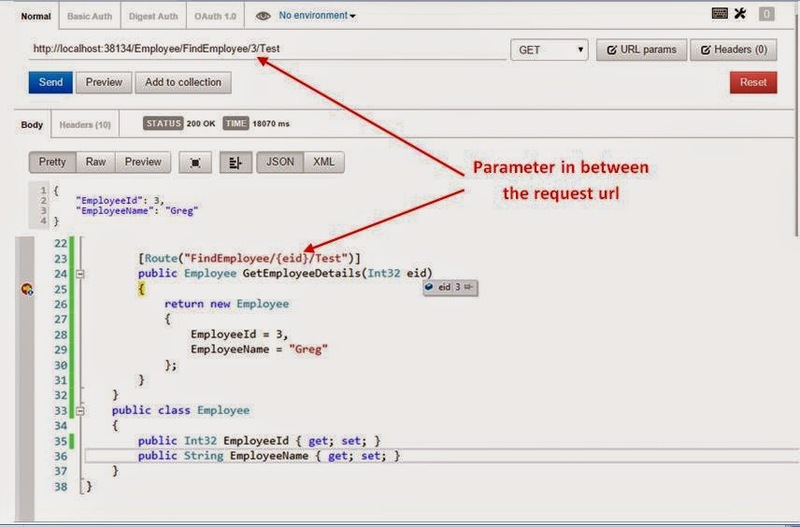 Now, let's see how we can send parameters to the request url. For this, we will be required to change the Route template and add a placeholder in it, which will be replaced by the parameter from the GET request. Let's change our url and send the request again. That look's great. 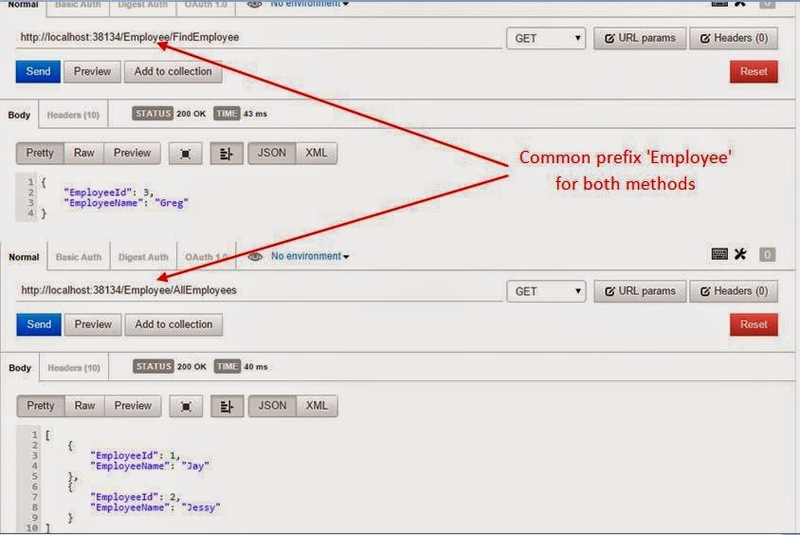 This means we can name our url's differently and hide the actual method names from the client code. Simply specify the type along with the placeholder, separated by a colon(:). Now try to send the request with a value less than 10 and we get the 404 error. Change the value to greater than equal to 10 and it starts working again. 1. We have the Route attribute at the method level, to define routing templates. 2. 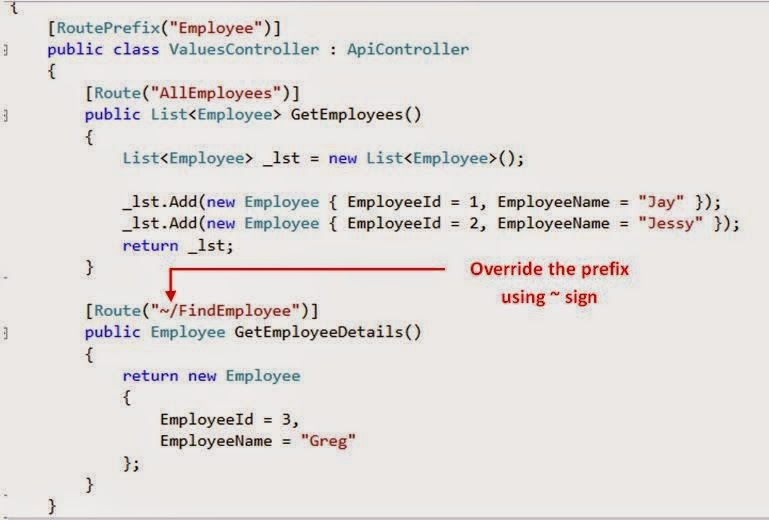 We can define a common prefix for all the methods of the api controller, using RoutePrefix attribute. 3. We can override the RoutePrefix on a method, using the tilde(~) sign. 6. 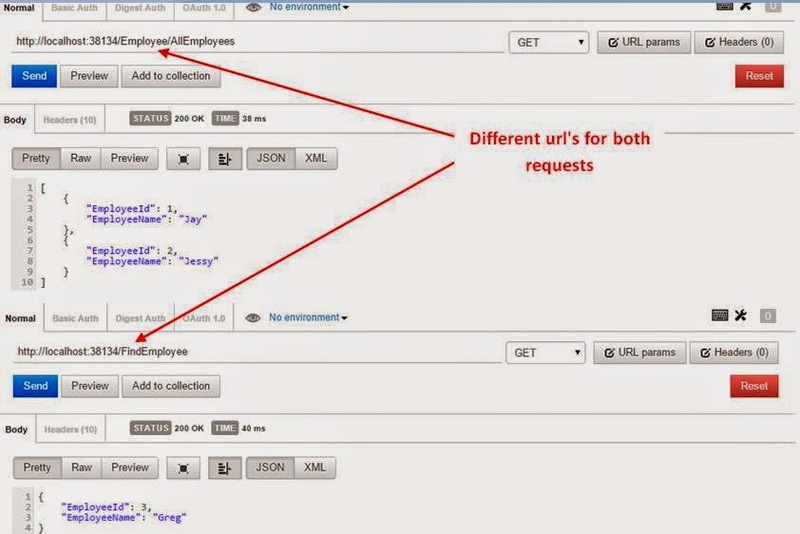 We can add certain constraints on the url parameters, i.e. their type or the values they can have, within the template itself. 7. We can also have optional parameters in the methods, but with the condition that they must have a default value assigned to them. 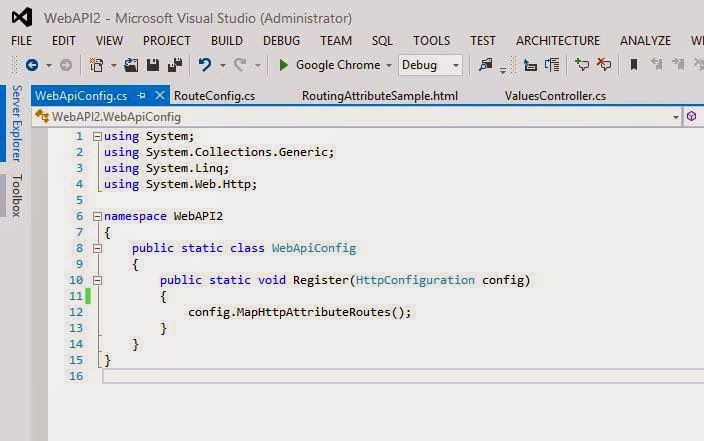 So this was about the use of the Route and RoutePrefix attributes in webapi2. Sample code is attached with this discussion. Hope you enjoyed reading it. Happy coding...!!! Thanks for sharing the article. can i implement the same feature in share point as a web part? Do you have any idea regarding this..